I try to post every Friday, but for the last few weeks I have had my feet knocked out from under me, and it was Vici that did it, that finally broke me. Conquered, indeed. Top notes: angelica, cardamom, pink pepper, basil, galbanum and aldehydes. Heart: lavender, iris, osmanthus, incense, and celery seed. Base: patchouli, musk, vanilla, cedar and raspberry. This tells you nothing of any use. 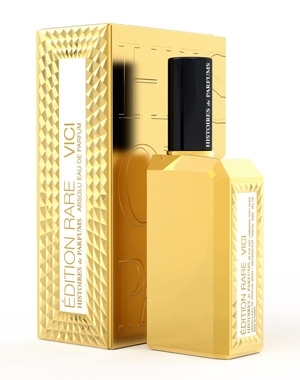 There could be anything at all in the bottle, and it wouldn't matter, because Vici smells like any other men's scent on the market, and you could not possibly tell it from any of the hundreds of other identical things that you smell every day. I wore it for a couple of days, as I always do, and tried to write about it, and then I just gave up. I not only gave up trying to write about it: I was so dispirited that I couldn't even be bothered to wear any scents for more than a week, an unprecedented occurrence. Eventually I got back into it, of course, via Serge Lutens, of course, but for that week I just ignored my collection, ignored my sense of smell altogether, because after wearing Vici a number of times and trying to think of something to say about it, anything at all, it struck me that if this, this complete absence of interest and novelty, was what was passing for niche perfumery, then the whole enterprise of perfumery, the whole art of it, was ruined beyond hope of repair. I write about scents for my own pleasure: I like the fact that people read what I have to say, but I'd be doing it without an audience, because thinking about something and putting it some sort of logical format is enjoyable in its own way. I like seeing if I can write an entire 150-plus-word review in the form of a single compound-complex sentence (I can), if I can write a review a day for an entire month (I just about did, too). I just like to write and I love perfume. But the sheer misery and the fraud that is Vici erased all that, for a while. There are well over a thousand new scents released every year, and the number keeps increasing. If you were a movie reviewer and there were a thousand movies being released a year, and ninety-nine per cent of them were romantic comedies and action films with the same small and tired stable of stars, how many would you have to see before you swore off movies altogether and found something else to write about? How hard would you be willing to work to find something, anything of even the slightest interest in your field to write about? I'm on the road for the next few weeks. There's a small chance I'll find a thing or two to review in the interim, but worst-case scenario, I ought to be back to it by May 24th, if I can steer clear of glum, shameful nonentities like Vici. If nothing else, it'll be lilac season by then, and if there's anything that can brighten a day like the tendrils of fresh lilac perfume in the air, I don't know about it.